As part of your web based strategy you will need to integrate conventional marketing activities into the mix. Conventional marketing can add value to your website presence with campaign coordination and electronic email newsletters. 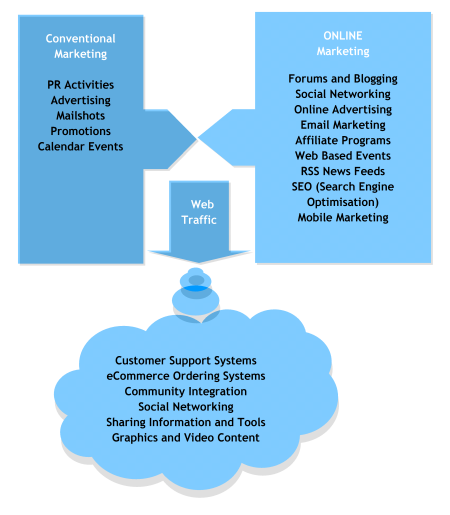 By integrating online marketing with conventional marketing you will very effectively drive traffic to your website. This is why it is so important to have an effective and structured website with good content. Once you have managed to get your prospective and existing customers onto your website - you need to give them a reason to stay there! Websites now require full interaction with customers. It's no longer acceptable to have a website that 'pushes' information to clients; you now need to have a website that gives your clients the ability to feed information back - effectively your website has to be a two way process. We will sit down with you and help to create an effective eMarketing Strategy that will take into account Blogging, Email Marketing, Social Networking, RSS News Feeds, Mobile Marketing and many other functions that will ultimately drive traffic to your website. The Strategy is planned over 12 months and would typically align with your conventional marketing strategy to give you a complete Marketing Mix - both conventional and electronic Marketing. SEO will be a key part of your content for the Web. All your content can be checked and optimised via our staff at Micro Update to ensure that it is optimised for the search engines and your goals. In order to check that you are achieving your goals and metrics, we setup analytics on all web and email based activities. This ensures that you can monitor your email campaigns and optimise the content to target particular audiences. All website activity is monitored and can be analysed at anyy time. As standard all our websites come with analytics and a standard report is created once a month - or if you prefer you can monitor activity yourself at anytime. By carefully monitoring the content of your website and email campaigns we can finely tune your systems to ensure that you are hitting your target audiences effectively and consistently.